Your Subconscious Mind Holds the Key to Being Able to Maintain Good Posture! Steve G. Jones, Ed.D., Clinical Hypnotherapist, charges $1,500 for a custom recording and $25,000 for a one-hour private hypnotherapy session at his office. But you can get all the benefits for this low price. 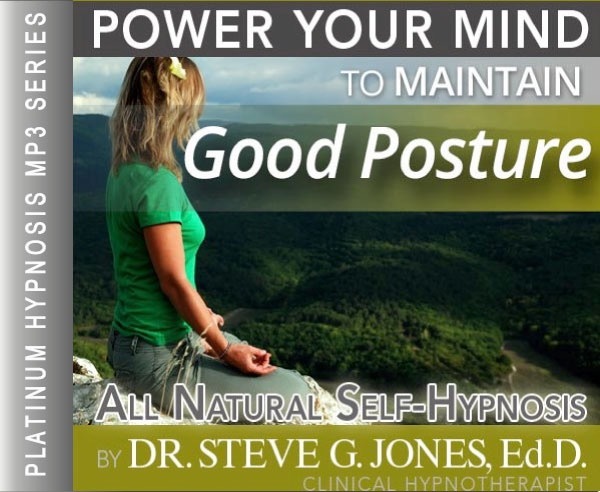 Simply listen to the Good Posture Hypnosis MP3 every night as you go to bed for three weeks and feel the changes happening in your life. You will feel more empowered, more in touch with your true self, and you will truly know that your goals are within your reach. It’s easier than you think. Steve G. Jones achieves AMAZING and LASTING results!!! Hypnosis is the easiest way to affect change in your life because the positive messages go straight to your subconscious mind effortlessly so you can accomplish your goals and reach for the stars!! All you have to do is listen to the Good Posture Hypnosis MP3 download at night as you go to sleep!!! You’ll hear soft music, the gentle sounds of the beach, and the soothing sound of Steve G. Jones’ voice all working together to bring about positive changes in your life easily and naturally. Steve G. Jones has been helping people improve their lives with hypnosis for over 17 years…now it’s time for him to help YOU… don’t wait, do it NOW !!! you’ll be glad you did. See you at the top! And as you continue relaxing deeper, deeper and more deeply relaxed, you realize just how powerful you are, just how powerful your mind is. Your mind has the ability to control every function of your body even while you are paying attention to other things. For example, your mind controls your heartbeat. Your mind controls your breathing. Your mind controls the temperature of your body. Your mind also controls the position of your body. I’d like you now to imagine yourself standing with perfect posture, that’s right. Perfect posture. See yourself standing upright. Your spine is in the perfect position, exactly as it should be as you stand upright. And your subconscious mind is now directed to always make sure that when you stand upright you maintain perfect posture. Imagine yourself sitting now with perfect posture. Sitting upright, imagine this, see yourself sitting with perfect posture and your subconscious mind will now realize and actualize this image. So that every time you sit, you sit with perfect posture. And every time you stand, you stand with perfect posture. Because just as your subconscious mind regulates your heartbeat, your breathing, and the temperature of your body, your subconscious mind also regulates your posture. So from now on you will maintain perfect posture at all times whether sitting or standing. And this will happen even if you’re focusing on other things. Day by day this will become easier and easier for you because your good posture makes you happy because you realize that it is beneficial to you to sit and stand in the proper way. It allows your spine to be upright and for your nerves to function properly. So relax. Your posture is very important to your overall health. Your posture shapes the vertebrae in your back and the muscles and tendons in your neck, shoulders, and back. Over time, you can do damage by not having good posture. As you age, you want to keep your neck, shoulders and back strong so that you can stay active. Often times, you are probably not aware of your posture. This is where hypnotherapy helps. The Good Posture Hypnosis MP3 audio targets your subconscious mind to remind you to keep proper form. Maintaining good posture means your neck is in line with your back, not sitting forward. Your shoulders will be square, not hunched. And your entire backbone will be straight. Under hypnosis, your subconscious mind will receive positive suggestions encouraging good posture whether you are sitting, standing, exercising, or sleeping. Good posture keeps all the muscles and ligaments in your body aligned and working well. Posture isn’t all about your back either. Good posture includes your neck, shoulders, arms, and legs. We suggest listening to the Good Posture Hypnosis MP3 recording for 3 weeks before going to bed. During this time, the hypnosis will embed positive affirmations in your subconscious mind about having good posture. Many people notice a change right away. The benefits of having good posture will change your overall health for years and years to come. We also suggest that after the three weeks, you continue to listen to the hypnosis session on an as needed basis, like a maintenance plan. Bad posture is a bad habit that can easily be overcome with this hypnosis program.